Home iOS iOSProgramming Swift UISearchBar Customise UISearchBar in Swift. The UISearchBar class have textField control to text based search. The control providing a textfield for text search, a search button , cancel button , search symbol in search textfield. 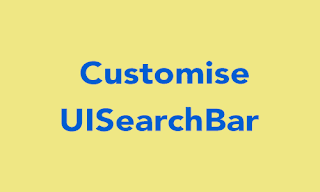 Search have its own delegate known as UISearchBar Delegate. 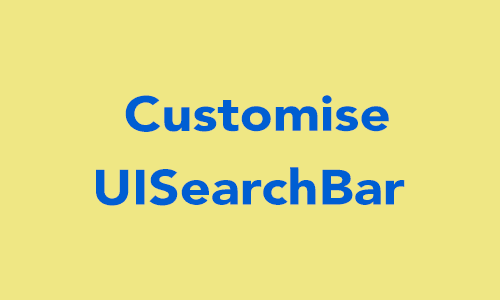 But here only discuss about customise of UISearchBar. This tutorial providing the code about the customisation of UISearchBar in swift. Way 1 : code to change placeholder of textField of UISearchBar. Way 2 : code to change placeholder of textField of UISearchBar. Way 1 : Make one extension of UISearchBar to change color of textSearch. See the extension code. Now Apply the code on UISearchBar. Way 2 : direct fetch subview and change color of textSearch of UISearchBar. 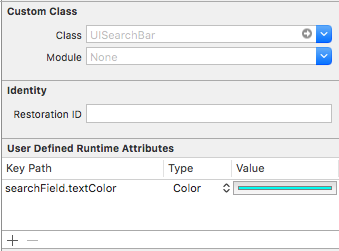 Way 3 : You can also change textcolor of UISearchBar using user define runtime attribute. so select your searchBar and click on identity inspector. set below value in user define runtime attribute. Value : RGB value from color Picker. Way 1 : Change the color of search icon. Way 2 : Change the image of Search icon. UISearchBar have default title is Cancel, Here title change Cancel to Delete and also change color of Delete button. Code for change image of clear button. Please comment for more improve the document. I changed according to comment. Any missing you find also comment.